River Plate is one of the most successful football clubs in South America with over 30 national top-league titles and trophies from both Intercontinental Cup and Copa Libertadores. The team is also famous from the legendary days in the 1940s when it was called La Máquina and fronted by Juan Carlos Muñoz, José Manuel Moreno, Adolfo Pedernera, Ángel Labruna, and Félix Loustau. 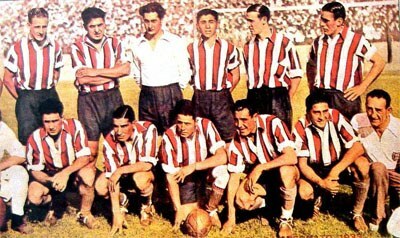 River Plate squad in 1944. Club Atlético River Plate was founded in 1901 by the merger between Santa Roas and La Rosales. They played their first matches in Dársena Sur, located in La Boca a barrio in the southeast and near the port of Buenos Aires. In the same area, another team was founded: Boca Juniors. The rivality of the clubs have last for over a century. For a long time, the clubs were characterized by different playing styles. While Boca was associated with a physical game, River was known for their passing game – the la nuestra style. The name arose, according to various sources, after some club members saw the words “River plate” printed on some crates in an industry area nearby. The first official match was played in 1905, in the third division (Primera B Metropolitana). Three years later, River Plate was promoted to first division (Primera División). The club seemed to need a new home ground and they built their first own stadium, La Boca. River Plate team picture from 1910. In 1923, River re-located north and installed themselves in the Alvear y Tagle stadium with a capacity for 40,000. In the 1910s, River Plate became a club that occasionally won titles, but it was not until the 1930s and 1940s that the club managed to be one of the dominant Argentine clubs. Team picture from 1933 with Bernabé Ferreyra sitting second from left. 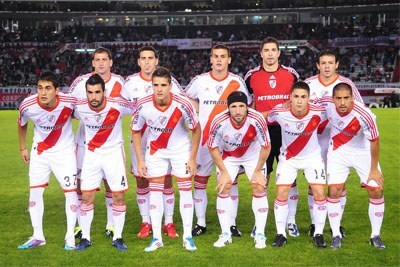 River earn the nickname “Los Millinarios” due to several expensive player transfers. In 1931, Bernabé Ferreyra was transferred for what when was a record sum in Argentine football: 35,000 pesos. The transfer record would stand for twenty years. Luckily enough, Ferreyra seemed to be worth the investment: he scored 187 in 185 games for the club. Between 1936 and 1938, El Monumental was constructed. It was a modern stadium which would become the new home for the team. In the first match on May 25, 1938 around 65,000 people was gathered at El Monumental, including the Argentine president Roberto Mariá Ortiz, to watch River Plate play. La Máquin marks a special era in the club’s history. La Máquin, that in English can be translated to “the Machine”, was primarily attributed to the five attacking players Juan Carlos Muñoz, José Manuel Moreno, Adolfo Pedernera, Ángel Labruna, and Félix Loustau that belong to the side during the period 1941-1949. The 1940s was a great decade in the history of the club. River Plate were among the top three teams in the league every year, they won it four times and was four times runners-up. Impressively enough, they would be even more dominating in the domestic football the decade that followed. Between 1952 and 1957 they positioned themselves on top five out of six seasons. The superb results couldn’t hold on forever though. Some of the top players were sold, including Omar Sívori, by many regarding as one of the best in the world at the time and he would become a star in Juventus. 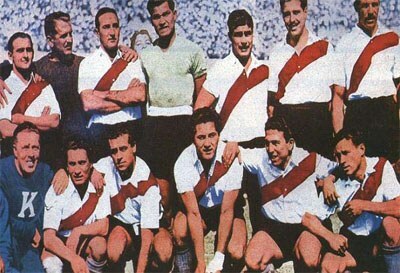 River Plate became use to finish second in the 1960s and none league trophy was added to the silverware. 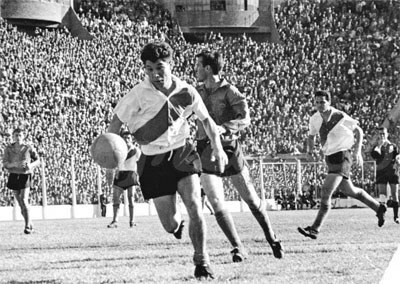 Omar Sívori with the ball. 1986 was a tremendous year for River Plate, winning an impressive treble containing the Intercontinental, the Copa Libertadores and the Primera División. In the league, they were untouchable, winning by a ten-point marginal to the second placed team. By beating Steaua Bucureşti in Tokyo by 1-0, River Plate became the fifth Argentinian club to claim the Intercontinental title. In the same year, they also won Copa Libertadores for the first time after defeating the Colombian club América by 3-1 in a two-legged tie. Another great success came ten years later. River Plate with the youngsters Hernan Crespo and Ariel Ortega and a 35-years old Enzo Francescoli secured the victory of the 37th edition of Copa Libertadores by a 2-0 win against América de Cali in Buenos Aires. After astonishing records in the 1990s, what followed was one of the club's worse periods. After losing many of the talents, the club were relegated for the first time of its history in 2011. The relegation was based on the three latest season's point average according to the league system, which led to a two-legged playoff match which they lost against Belgrano. River would, nevertheless, bounce back to the first division directly after one season. The comeback was emphasized a few years later when River won its third Libertadores and their first Recopa Sudamericana the same season. The Argentine football club River plate should not be confused with the Uruguayan club Club Atlético River Plate (former River Plate FC), which also plays in red and white shirts. The logo consists of a shield with a diagonal red line corresponding to the shirt. Over the line a circle is positioned with the “CARP” initials inside. The initials stand for Club Atlético River Plate. It has existed two main alternative versions. The first adopted logo consisted only of the initials, which by the time evolved to include a circle. The second alternative logo was in use for a shorter period and featured a lion. 1901 The club is established. 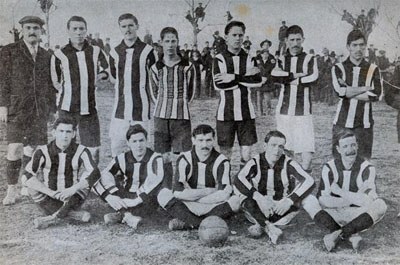 1905 The team start to use a white jersey with a diagonal red band. 1909 The team change home kit jersey to red and white lines. 1914 First club title (Copa de Competencia Jockey Club). 1920 First domestic top-league title. 1932 The team goes back to use their old jersey with the red band. 1986 Winning their first Copa Libertadores. 1986 River Plate become the fifth Argentinian club to win the Intercontinental Cup. 2011 The team is relegated from the first division for the first time.